Psych grunge trio Parliaments are headlining the Roadmender on Friday. 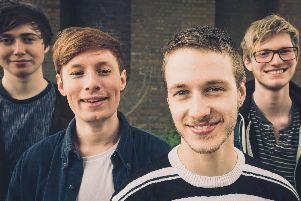 The trio comprise singer and guitarist Jordan Noon, bassist and synth player Callum Ahern and drummer and percussionist Ally Wilkinson. Parliaments released the music video for the new single Red Sun, Dead Moon earlier this month. The video sees the band awaking the physical representations of death who emerges from a slumber and is drawn to their sound. The band’s spirits are then led to a fire pit for a ritual while their physical vessels remain in a cellar playing. The track was recorded at Parlour Studios in Kettering and produced by Jay Russell. Support is by fellow Northampton quartet Fox Chapel and North London’s Phantom Isle. Fox Chapel’s latest single Lie Low was released earlier this year. BBC Introducing’s Lal Muttock will be DJing. Tickets cost £5 in advance before fees. Doors open at 7.30pm.